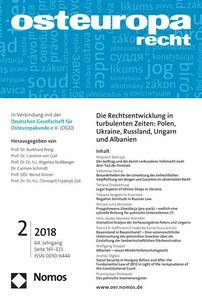 The journal “Osteuropa Recht”, published by Deutsche Gesellschaft für Osteuropakunde e.V. (DGO), is preparing a special issue on memory laws in Central and Eastern Europe and invites scholars and practitioners to submit their contributions. In recent years there has been a rise of legislative projects and judicial trials dealing with history and memory. Laws on memory have played an important role in memory politics, mainstreaming historiography of the ruling parties by marginalizing and criminalizing alternative historical perspectives. 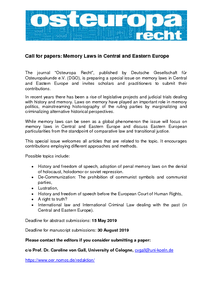 While memory laws can be seen as a global phenomenon the issue will focus on memory laws in Central and Eastern Europe and discuss Eastern European particularities from the standpoint of comparative law and transitional justice. This special issue welcomes all articles that are related to the topic. It encourages contributions employing different approaches and methods. Bitte beachten Sie, dass das Institut und die Bibliothek im Zeitraum von Montag, dem 08.04.2019, bis zum Montag, dem 15.04.2019, lediglich von 09:00 Uhr bis 13:00 Uhr geöffnet sind. Prof. Dr. Dr. h.c. Angelika Nußberger wurde im vergangenen Januar 2019 die Ehrendoktorwürde der Lucian-Blaga-Universität in Hermannstadt (Sibiu), Rumänien verliehen. Zu ihren Ehren wurde am 18. Januar 2019 an der Lucian-Blaga-Universität ein Festakt ausgerichtet. Die Laudatio hielt Prof. Dr. Horaţiu Rusu. 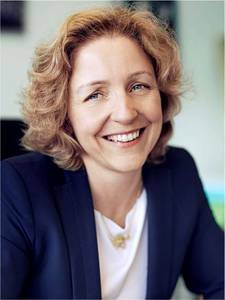 Das gesamte Team des Instituts gratuliert Angelika Nußberger ganz herzlich! Das Inhaltsverzeichnis können Sie hier einsehen. Weitere Informationen über den Bezug und ein Abonnement der Zeitschrift finden Sie auf der Homepage des nomos-Verlages.